"We were going on a cruise for spring break and had hired a limo to go from the airport to Long Beach," said Neil Martin. "We had time to spare, so the driver took us for a tour of L.A. and one stop was the Santa Monica pier. After walking the pier and loading back into the limo, I spotted this gentleman and grabbed the shot out the window." 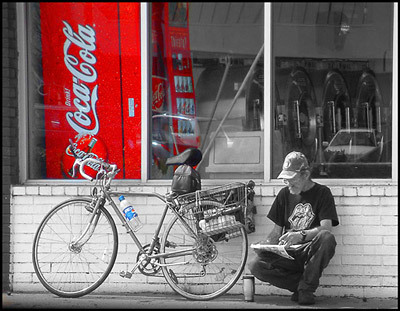 "I liked the color contrast between the Coke machine in the laundromat window and the Pepsi bottle on his bike. Back home, I used Photoshop Elements to isolate and intensify the two colors. By selecting the brush tool on the color setting and working carefully, I eliminated all the other colors." Neil used a Fuji Fine Pix S602 Zoom set to f/2.8, 1/80 sec. at 200 ISO. This would be interesting to see if you let the rolling stones logo be Red as well, and make the pepsi bottle black and white again. Substantially, the post is really the sweetest on this worthw hile topic. I fit in with your conclusions and will thirstily look forward to your next updates. Saying thanks will not just be adequate, for the phenomenal clarity in your writing. I will at once grab your rss feed to stay abreast of any updates. Good work and much success in your business efforts!